Zenna Home Roller Shower Hooks. The Roller Shower Hook in Chrome (12-Pack) is durable and made of plated steel. The shower hooks have a silver chrome finish and the heads are square. Five knobs allow for adjustable placement and locking of the curtain. The Griipa Satin Nickel Hook combines style with an amazing new hanging device that you can apply to smooth, flat, shiny surfaces without tools, adhesives or fasteners. It is far superior to suction type hooks in its holding power and versatility. Rust proof corner shower bin featuring Gel Lock technology to hold strong on tile, glass and other smooth and uneven surfaces. The Flex Gel Lock corner bin features 2 adjustable Gel Lock suction cups, an integrated soap dish, 2 hooks and nestles neatly in the corner. The rubber band allows to squeeze that extra large bottle with a tight hold. Made of ABS and silicone. Rust proof shower bin featuring Gel Lock technology suction cups to hold strong on tile, glass and other smooth and uneven surfaces. The Flex Gel Lock shower bin features 2 adjustable Gel Lock suction cups, an integrated soap dish, 3 shampoo draining holes and 2 hooks. The rubber band allows to squeeze that extra large bottle with a tight hold and acts as a razor holder. Made of ABS and silicone. Roller Shower Hooks. 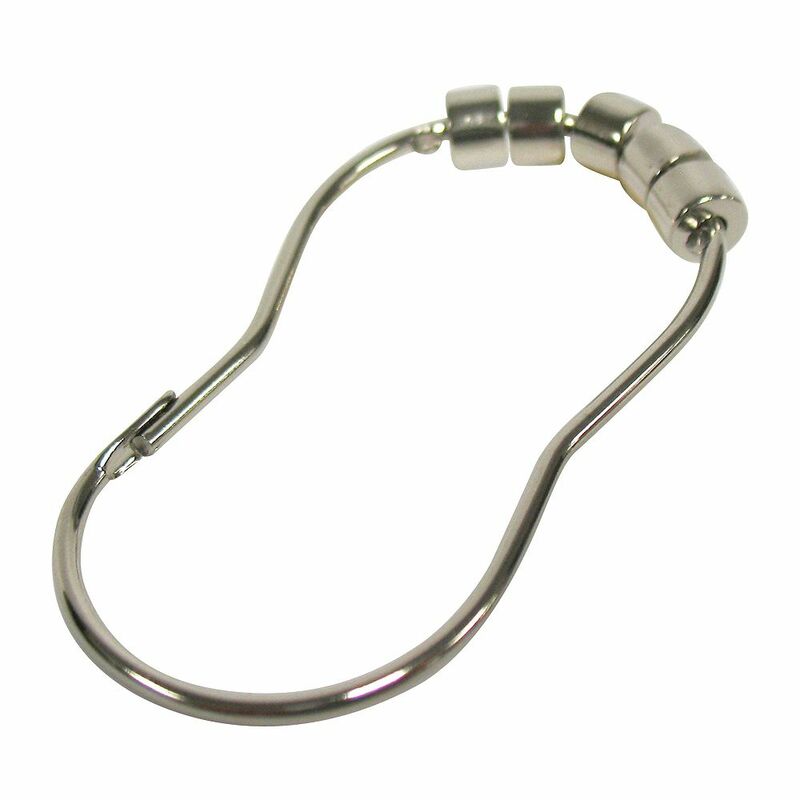 The Roller Shower Hook in Chrome (12-Pack) is durable and made of plated steel. The shower hooks have a silver chrome finish and the heads are square. Five knobs allow for adjustable placement and locking of the curtain. Roller Shower Hooks. is rated 3.7 out of 5 by 6. Rated 5 out of 5 by mercury from An excellent product. It was easy to install. It a product that I would recommend. Rated 1 out of 5 by Mark from Not Brushed Nickel as advertised. This product is not Brushed Nickel as advertised. It is clearly marked on the package as stainless steel, and is very shiny! I returned it. Rated 5 out of 5 by Pola from look great, function well Great hooks, do what they're supposed to. Hold up a heavy terry cloth shower curtain. Rated 1 out of 5 by NJBarbie from Rusted in 3 months. Purchased these only 3 months and they are rusting bad! Not worth the money if they need to be replaced evry 3 months. Rated 5 out of 5 by Regis from Great idea I love the smooth operation of the shower curtain this product enables.